2006 | Www.archtomato.coM | Minimum B.S. Visualised by archtomato On Sunday, December 31, 2006 at 16:00 Hrs | Minimum B.S. a. using a rabid porcupine to scratch my back. b. having a head that looks exactly like a soccer ball and living in Brazil. c. being Darth Vader about an hour before he gets the helmet and suit. That’s because i have just met my project deadline. Its over now and completely successful. For the first time in many months now, i can breathe through my nose again. I can start writing crappy articles like this one again. For those of you thinking about the same plight that you are in, I’d say its worth it (now that its over, i can start talking like a saint). I finally got paid and now i am already contemplating of avenues to invest the money in. I’m also thankful that my particular skill set includes writing Web applications in ASP and PHP and troubleshooting server inconsistencies. I could have been born with the skill for painting miniature Taj Mahals on bottle caps. I’m lucky and thankful for it. I’m thankful that I can reach almost every part of my body in case I get an itch. Except for the middle of my back, which is the only place I ever get one. But I’m not going to quibble today. I’m thankful. They say that speed kills. I am not really sure who “They” are, or what’s being killed, but if the dictum is true, then i am thankful that i have managed to hold on to dear life and not kill anyone. I will come up with a warning label for 2007. I’m thankful that i don’t get turned on by looking at myself in the mirror. My friend Tok, can stand by the mirror touching himself for hours at an end. I am thankful i am not him. I am thankful. I’m thankful that i’m not married or don’t have kids. Its getting freaking uneconomical to actually raise children. i would like to propose to the relevent authorities to encourage people to raise chickens instead. I should also be probably thankful that i dont’t pay tax, but somehow i always feel that my money is being absorbed by an agent in a black suit employing his cheap jedi mind tricks on me. Life is about making choices. There is no other choice. I am thankful that i have never had to choose the wrong ones. I’m sure there are a more things I should be thankful for, but I take all of those things for granted. And the privilege of doing so is perhaps the thing I am most thankful for. To my fellow friends and readers, a new year brings its own set of challenges. But lets always remember the past and be thankful for the good things in life. When was the last time you thought about what you would want to be thankful about? ps: Joyous 2007 everyone !!! Visualised by archtomato On Sunday, December 31, 2006 at 10:22 Hrs | Minimum B.S. Have a Good Year Ahead. Had a blast yesterday watching the antics of a drunk freak. ps:Another crappy year to waste. Visualised by archtomato On Saturday, December 30, 2006 at 9:53 Hrs | Minimum B.S. I would like to start by wishing the people of his former administration a heart felt congratulations. ps:Micheal Jackson is going to be a widow now that Sadaam is gone. Visualised by archtomato On Sunday, December 17, 2006 at 16:00 Hrs | Minimum B.S. ps: Couldnt Think of anything else. Visualised by archtomato On Thursday, December 7, 2006 at 16:00 Hrs | Minimum B.S. I have writer’s block. I hate writer’s block. It always happens to me during the time periods in my life when I don’t have anything to do. Then, just as my life is starting to get hectic, just as i start to have deadline after deadline after deadline pile on top of my head, the block becomes dislodged and I find myself furiously typing away at my keyboard, spending an hour here or two hours there frantically typing, when in reality i should be working on something else. My worries? Well, i am so darn busy, i don’t even have time to breathe. I usually get fresh ideas for my articles while i am at work. Why not NOW when i’m staring at my word document and have nothing ELSE to do!?? I thought of writing about how Singapore did at the DOHA games. But then again i suppose everyone already knows, and also how Singapore will do in the next games. So moving on, i thought of expressing political opinions at the recent announcement of our upcoming economic enhancement policy which will benefit the poor. But that will probably lead me downhill rather quickly. Finally i settled on writing some thought provoking, heart wrenching article on fighting for women’s rights. But following up on the thoght process, i quickly realized i knew next to zero about them and i really didn’t care. So at this point i gave up on writing an article. My cousin just got hitched yesterday and we had a bash over at Aloha Chalet. Even that joyous occasion doesn’t make me want to write something. I took photos to publish but now i feel that it should probably stay within the family. I have writer’s block. I hate writer’s block. Can you stand anymore randomness? Oh well. Alright, I’m going to try to write something now. ps: Nitewing promised to be a guest blogger and left me dry. I have sworn eternal vengeance. There will be a backlash. There and Back Again ! Visualised by archtomato On Wednesday, November 29, 2006 at 8:04 Hrs | Minimum B.S. You can divide your whole life into two basic categories. You’re either staying in or going out. Everything else is irrelevant detail. The urge to go out and then return is very strong. go out. We must go back. When you’re out, everything is a little out of control and exciting. ps: I don’t wear half torn underwear. I give them to the needy. Visualised by archtomato On Saturday, November 11, 2006 at 3:11 Hrs | Minimum B.S. TV has so much power. I know it does. Because I bought the Ginsu knife about five years back. I did. The Ginsu 2000, actually. I can’t believe I did it. I can’t believe I wrote the number down. I can’t believe I called it. I can’t believe I gave them my credit card number. pretty good.” I don’t think I can cut through a shoe with any of my knives. What if I get a knot in the laces and I can’t get out of my shoe? How am I going to get out? I’ll have to cut my way out. I need that knife. So I called up and incredible as it may seem, I actually spoke these words. I said, “I would like to order the Ginsu knife.” Yes, I said it. And the lady on the phone just went, “Really?” Even the Ginsu people can’t believe anybody would actually want this thing. So now I have it, my shoes are all cut in half, the people i don’t like skinned alive, and I don’t watch TV late at night anymore. ps: I have since then given away my Ginsu 2000 to the needy. Visualised by archtomato On Tuesday, October 31, 2006 at 16:00 Hrs | Minimum B.S. To me the worst thing about television is that everybody you see on television is doing something better than what you’re doing. You never see anybody on TV just sliding off the front of the sofa with potato chip crumbs all over their shirt. Some people are having a little too much fun on television. The coke commercial people, where do they get this enthusiasm? Have you seen them? Jumping, laughing, flying through the air. It’s a can of COKE for goodness sake! Have you ever been sitting there watching TV and you’re drinking the exact same product that they’re advertising right there on TV? And they’re spiking volleyballs, jet skiing, stealing t-shirts from Jamaicans and girls in bikinis. And then you look around and see yourself drinking the product all alone in your small little flat going, "Maybe I’m putting too much ice in mine. I’m not getting that as seen on TV effect." Don’t you hate "To Be Continued"s on TV? It’s horrible when you sense the "To Be Continued" coming. You know you’re watching the show, you’re into the story, then there’s like five minutes left and suddenly you realize, "Hey, they can’t make it. Aaron Aziz’s still stuck in the cave. There’s no way they can wrap this up in five minutes." I mean the whole reason you watch a TV show is because it ends. If I wanted a long, boring story with no point to it, I’ve got my life and perhaps yours too. Visualised by archtomato On Wednesday, October 25, 2006 at 10:54 Hrs | Minimum B.S. We don’t really care why the chicken crossed the road. We just want to know if the chicken is on our side of the road or not. The chicken is either with us or it is against us. There is no middle ground here. I have just released eChicken 2003, which will not only cross roads, but will lay eggs, file your important documents, and balance your checkbook – and Internet Explorer is an inextricable part of eChicken. Did the chicken cross the road? Did he cross it with a toad? Yes, the chicken crossed the road, But why it crossed, I’ve not been told! In my day, we didn’t ask why the chicken crossed the road. Someone told us that the chicken crossed the road, and that was good enough for us. Why does anyone cross a road? I mean, why doesn’t anyone ever think to ask, "What the heck was this chicken doing walking around all over the place anyway?" Because the chicken was gay! Isn’t it obvious? Can’t you people see the plain truth in front of your face? 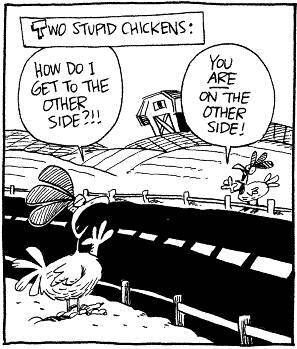 The chicken was going to the "other side." That’s what they call it — the other side. Yes, my friends, that chicken is gay. And, if you eat that chicken, you will become gay too. I say we boycott all chickens until we sort out this abomination that the liberal media whitewashes with seemingly harmless phrases like "the other side.". So tell me .. Why did the chicken cross the road? ps: This author is suffering from Writer’s block. Visualised by archtomato On Monday, October 23, 2006 at 11:47 Hrs | Minimum B.S. For remember this, in your heart lies great power. ps: This song was written in 2 mins.